I cut both of these out over the past week. This one is all my own fabric in the green and blue colorways that I haven’t really used yet- plus lots of light solid triangles. It’s going up on the design wall this week. This one isn’t getting design wall-ed. I like having something I can sew together without thinking right now. 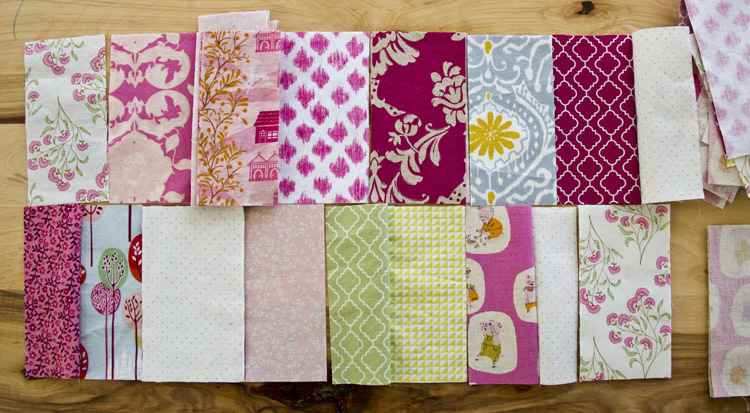 The Heather Ross piggies were my jumping-off point when choosing my fabrics. It combines a few of my fabrics with a bunch that I “had” to buy because they matched my fabric, but it still needs something… maybe a warmer reddish-pink? I’ll look around next time I get down into the fabric dungeon. those look like fun piles! i like the pink and red and green bunch. i think it might need more dark values. another dark cerise or a deeper green? I think you might be right. I had a plum-raspberry-ish solid picked out but then I pulled it. I’ll see how it looks again! And I didn’t really go through my stash when I pulled these fabrics- they are all from a recent purchase that’s not been put away. Who knows what else I have that will work here! 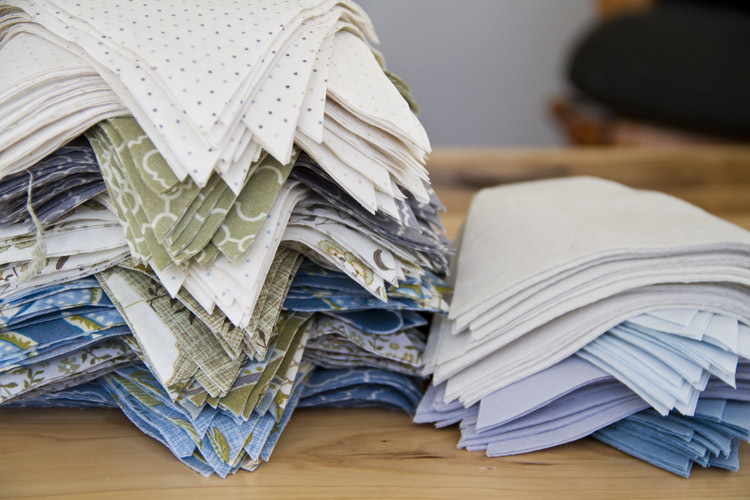 Can’t wait to see how these turn out – the second pile especially! Gorgeous, gorgeous! I like the blues and I guess that is as it should be since the ladies all like the pinks, LOL not to be so gender specific they both have lots of floral prints. The pink one speaks to me also, but mostly because I just love sewing little strips of this and that together, leftovers from projects or not, then putting them away for a while and picking them back up when I need some easy sewing time. What are you making with the triangles? 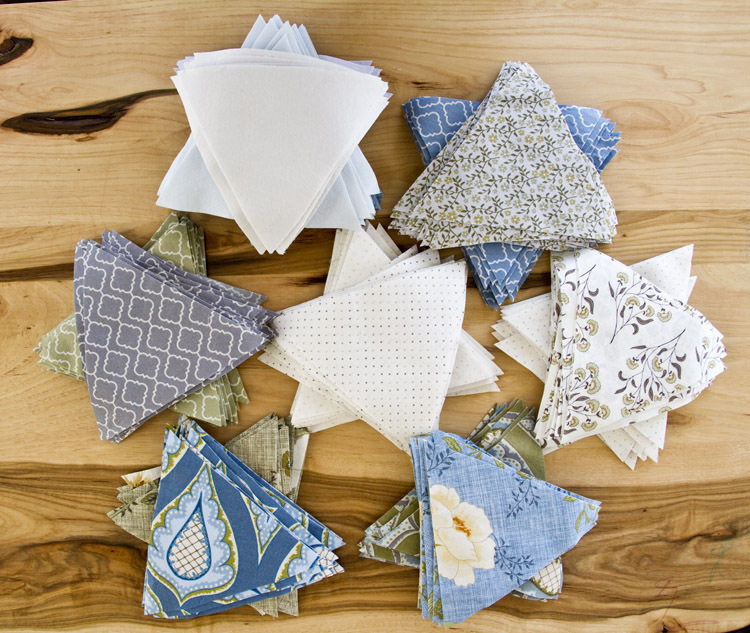 I am making a quilt with 6.5 inch triangle stars. I really like the Heather Ross print. I’ve never had any of her fabric.